Little sign of renewed respect for U.S.
‘America first’ or ‘America alone’? It’s no surprise that top administration officials have alighted on that claim. 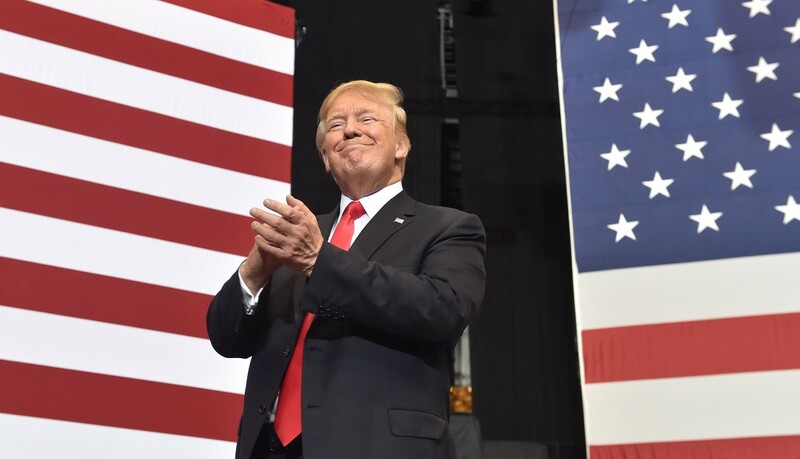 The president has been making it at every opportunity — during a rally last week in Nashville, at the U.S. Naval Academy commencement ceremony and in off-the-cuff remarks to White House reporters Friday, just to name the latest audiences. The evidence — both in nonpartisan polls and in the increasingly critical remarks of exasperated allies — suggests otherwise. The president’s bravado is about to be tested dramatically, beginning with a visit Thursday from Japan’s President Shinzo Abe. On the weekend, he is to attend a summit in Canada with other leaders of the G7 — the Group of Seven major powers — and then hold the most high-stakes event of all on Tuesday — his meeting in Singapore with North Korean leader Kim Jong Un. After 16 months, however, leaders of long-standing allies like Abe, France’s President Emmanuel Macron, Germany’s Chancellor Angela Merkel and Britain’s Prime Minister Theresa May — all initially deferential to Trump and his famous ego — have grown frustrated and at times disapproving. Significantly, so have their citizens, increasing the pressure on foreign leaders to distance themselves from Trump’s America. Across 134 countries, the median approval of U.S. leadership dropped 18 points in Trump’s first year, to a record low of just 30%, according to a Gallup survey released in January. That was before Trump’s decisions to withdraw from the Iran nuclear deal and impose tariffs on a number of allies, which further alienated many of them. The finding echoed a Pew Research Center survey last year that found in all but two of 37 nations polled, Trump got far lower marks than President Obama; the exceptions were Russia and Israel. “In the main, it’s a preposterous claim to say the U.S. is better regarded in the world when we haven’t had for many decades this many crises with our allies,” said Nicholas Burns, a career diplomat under several presidents — serving as ambassador to NATO and Greece and as undersecretary of State — and now a professor at Harvard’s Kennedy School of Government. Japan’s Abe, who initially worked to build warm personal relations with Trump, comes to the White House vexed by the president’s protectionist trade moves and failure to inform Japan, a close ally, when Trump scheduled, canceled and then rescheduled his summit with North Korea’s Kim. “The president’s inability to absorb information, combined with his certainty about the world and these things he doesn’t really understand — it’s doing a number on how other countries view the United States and our ability to get things done around the world,” said a former U.S. ambassador. To the extent that foreign leaders like Macron are seen as giving in to Trump, “that’s very unpopular at home for many of these leaders,” said Stephanie Segal, a fellow in political economy at the Center for Strategic and International Studies. No more. Several so-called globalists have departed the administration, or been pushed out, leaving the president to follow through on campaign promises that upend the post-World War II global order that America helped build. Last month, Trump withdrew from the Iran deal despite pleas from leaders of other countries that are party to it, most prominently Macron. Trump also oversaw the move of the U.S. Embassy in Israel from Tel Aviv to Jerusalem, inflaming regional tensions and angering allies who say Jerusalem’s status should be decided by the Palestinians and Israel. On Wednesday, Trump’s chief economic advisor, Larry Kudlow, dismissed the controversy as “a family dispute” that can be worked out. Yet he could not guarantee that Trump would sign the usual joint communique with the other G7 leaders. Trump’s claim of newfound “respect” for America is apparently based on his belief that allies have long “taken advantage” of American largesse and military might, and that other nations now know he’s put an end to their game. That attitude is rejected in most foreign capitals, who’ve looked to the United States to be the global leader for its own national interests as well as theirs. Now Washington is increasingly isolated, reflecting allies’ impatience. Trump’s unilateral actions have come to be seen not as part of an “America first” policy, but more like “America alone.” He has proven himself an unreliable partner, many allies say. Although Trump’s summit with Kim is back on, his failure to warn South Korean President Moon Jae-in prior to calling it off rankled, as it did Japan’s Abe. Yet last week, even as he celebrated the summit’s revival, Trump told reporters that North Korea is “6,000 miles away,” saying the onus is on Japan and South Korea to police their nuclear-armed neighbor. Stokols is a special correspondent. Times staff writer Tracy Wilkinson in Washington contributed to this report.